battery replaced a few days ago when it wasn't charging properly. enough to let the battery discharge a bit and then plugged it back in. Now it's claiming to be charging all the time at 99% charged. said that probably a signal was being misread and it wasn't a problem. no such thing as "not a problem" with lithium batteries. some habit of the user. The user is blameless in this. is more than most users would even realize. The article on charging is here. The diagram is here. Let's compare your symptoms. battery terminal voltage was a lot lower than the "stiff"
power supply of the wall adapter, a lot of current would flow. mode". This limits the Stage 1 current run through the battery. battery, without hurting it. This is done at a constant voltage. the battery, asymptotically approaches zero. the battery at that point. off. Instead of being at 3% current flow, you're at 5% or 10%. 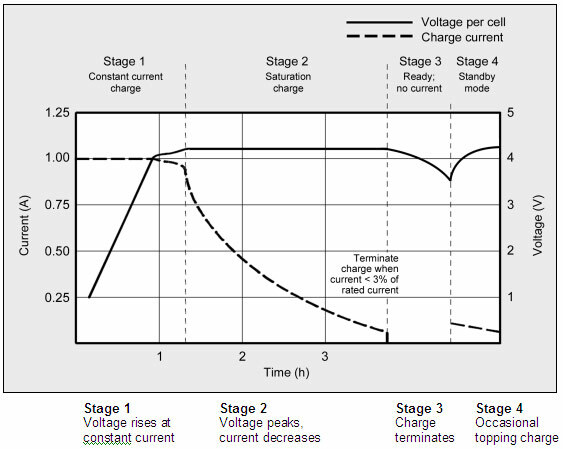 charge cycle is not able to complete. 1) Perform a calibration cycle. Disconnect AC. Run the laptop until the battery is drained. it still stuck at 99%. Check the manual to see if there is any mention of recalibration. charging it forever, unplugging the adapter will stop the behavior. seek to purchase another (legit) battery. battery problem occurred--which may mean the new battery is bad.